Twin Path® sling This is the world's first truly ergonomic sling.The Covermax outer casing giving Superior abrasion resistance. The Twin Path® overload tell-tails and red inner casing allowes for quick visual inspection of the sling for any damage. The condition of the core yarn can be inspected by the Fibre Opic cable. If crushing or cutting, heat or chemical damage has occurred then the optical fibre will not transmit light from one end to the other. Twin Path® are used worldwide in place of wire rope and chain slings for heavy lifts. They are also used in the mining industry for towing applications. They are about 10% the weight of a steel sling and are repairable. These slings have 1% stretch at rated capacity compared to polyester round slings that have up to 9% at rated capacity. If ergonomics, productivity and safety are important then these slings are the only choice. This is the lightest and strongest sling on the market today that incorporates the use of K-Spec® core the longest lasting load bearing yarn. All Twin Path Slings are manufactured using either out high performance fibre known as K-Spec or Polyester Core Fibre. Weight Advantage - 80% Lighter than steel wire rope/chain slings. - 50% Lighter than Polyester. Control of Slings - Lightweight allowing better control by operators. Storage, Retrieval and Salvage - Easily rolled and folded for storage. - Ease of transport. Water Resistant Covermax Outercover - Outercover fabric 4 times more abrasive than common nylon or polyester. Reduced Rigging Times - Up to 80% reduction rigging times. Safety - Reduce exposure to back and work related injury. 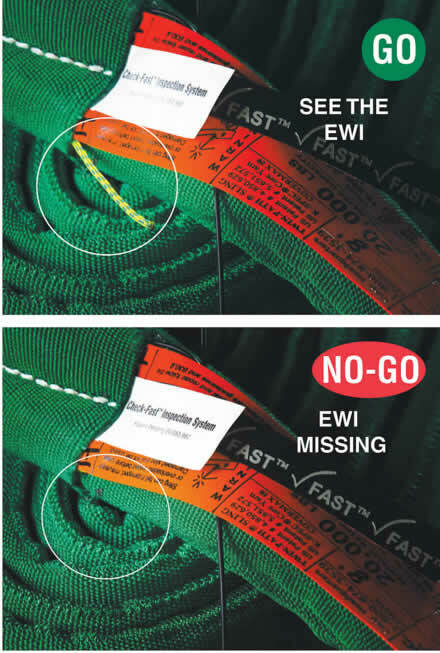 Tell tails / Optical Fibres - Allows continual monitoring of sling safety.